I'm very grateful to my wife Sonia for supplying a galley proof (please click here to see a copy) for p 941 of the 1995 edition of Debrett's Peerage & Baronetage which has helped to fill-in many of the details in this table. New arrivals since that time would be difficult to establish comprehensively and so for the time being I've terminated the table below Generation 0. And perhaps the kinship is becoming a little bit tenuous at this stage anyway. Also, when Googling for additional details, I've noticed that www.thepeerage.com keeps popping up, and it has provided a bonanza of useful information, though in an almost totally unpredictable sort of way. Please note in this table that familiar names are used rather than given forenames, where appropriate. These may be diminutives, alternative names (ekenames or nicknames) or simply subsidiary forenames, and I've tried to indicate these various possibilities in italicised parentheses. In every case only the first distinguishing name is given. 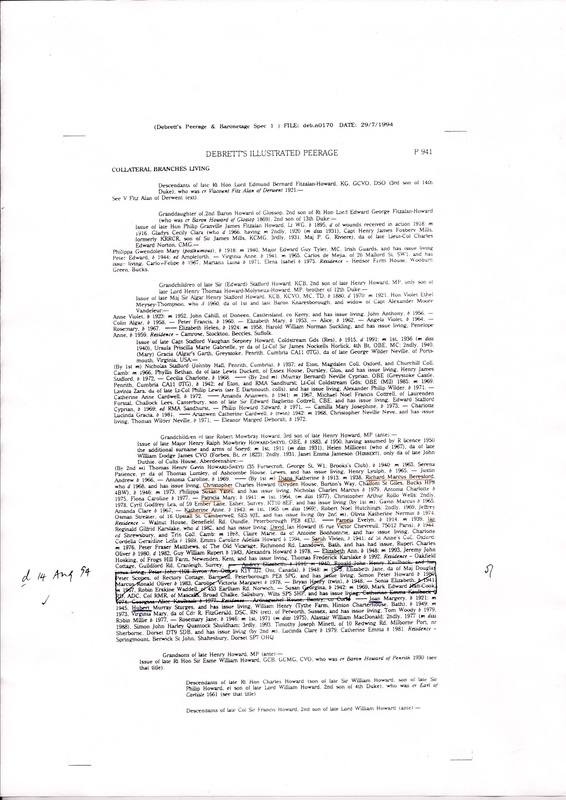 Henry Ralph Mowbray Howard is listed as Henry Howard. Henry Howard's first wife Helen Millicent James is listed as Millicent(2) James and their fourth daughter Rosemary (who died prior to 1995 and therefore doesn't appear in the Debrett listing) is identified as Tom. Henry Howard-Sneyd's second wife Janet Duthie is listed as Jan, and their son Thomas is likewise listed as Tom. Offspring are listed in chronological order of birth irrespective of gender (Debrett's list boys first, but we're in the 21st century now). § In the London Gazette of 27 Apr 1950, Maj Henry Howard, as he then was, my wife's maternal grandfather, officially changed the family name to Howard-Sneyd, as it remains to this day. This was presumably at the suggestion of Col Ralph Sneyd, prior to his death the previous December, that the family name of Sneyd should thereby be perpetuated. Not only had he no male heir to carry on the name, but there was evidently none in any of the collateral Sneyd lineages either. This change immediately affected Henry himself, his second wife Jan and their son Tom (plus Tom's future wife and family), of course, but his other offspring, all female, had now acquired married names and were entirely unaffected. The Howards and Kaulbacks were the very first connections I explored when beginning these family investigations, and it's now (Nov 2013) high time that the Howards in particular were given their due as the most distinguished of all our back-histories. 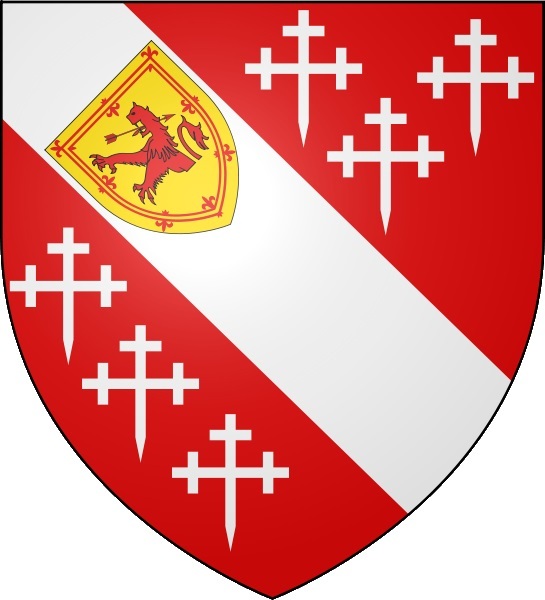 The family name of Howard has been associated with the Dukedom of Norfolk at least as far back as 1483 when John Howard, son of Margaret Mowbray, became 1st Duke of Norfolk of the 3rd creation (the two earlier creations having successively run out of steam – gluttons for punishment can retrospect to the first creation1, 2 by Edward I, the fons et origo of all three creations). It didn't do Howard personally a whole lot of good, as he was killed a couple of years later at Bosworth. But he provides a dynastic milestone for us to start from. But oddly enough, I did have some early encounters with one or two of these iconic monikers – as a small boy in Stalybridge, and just a little while later in Chichester, and I will touch on those later. The reason why we stop our ascent here is that it was at this point that the manor of Glossop first appeared on the long scroll of family possessions, and indeed from his grandson Col Bernard Howard (1641 – 1717) onwards this branch of the family have been known as the Glossop Howards. In fact we shall see that the HRMH line diverged from the Glossop Howards just two generations later, starting with Lord Henry Thomas Howard-Molyneux-Howard. Though still immensely prestigious, and impeccably patrician, it was no longer part of the nobility, strictly speaking. This may be a good point at which to mention that Bill Kaulback (The Kaulbacks, 1979) has provided a stirring account of the Howard line from John Howard down to the marriage of Henry Frederick Howard to Lady Elizabeth Stuart in 1626. We can get an excellent perspective of the blue-blooded Howards by clicking on an extraordinarily useful family tree produced by the Glossop Heritage Trust, their patron being Edward William Fitzalan Howard, 18th Duke. Note that the HRMH line diverges from the Glossop Howards at the 12th Duke, and also that his son the 13th Duke (known as Old Pepper and Potatoes) obtained a Royal Licence in 1842 for the family name to become Fitzalan-Howard (which didn't affect the HRMH line, of course) from the next generation onwards. 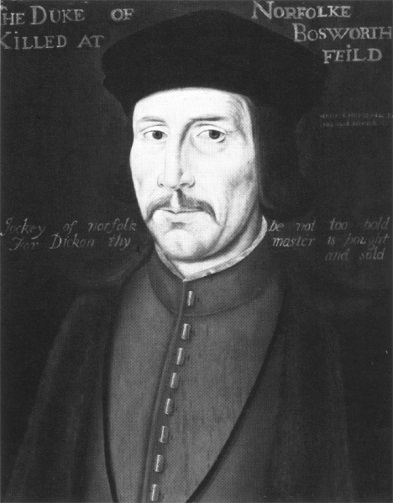 The Fitzalan-Howards are outside my remit here – having no obvious propinquity with the HRMH line, it would be supererogatory and indeed ultracrepidative of me to do more than simply tug my forelock in their general direction. It's also interesting to observe, from the time of Henry Frederick Howard onwards, how the title of Duke of Norfolk constantly switched from one branch of the Howards to another, always seeking the genetically closest male inheritor. Now that the monarchy has adopted gender-neutral inheritance, one wonders when the aristocracy will follow suit. 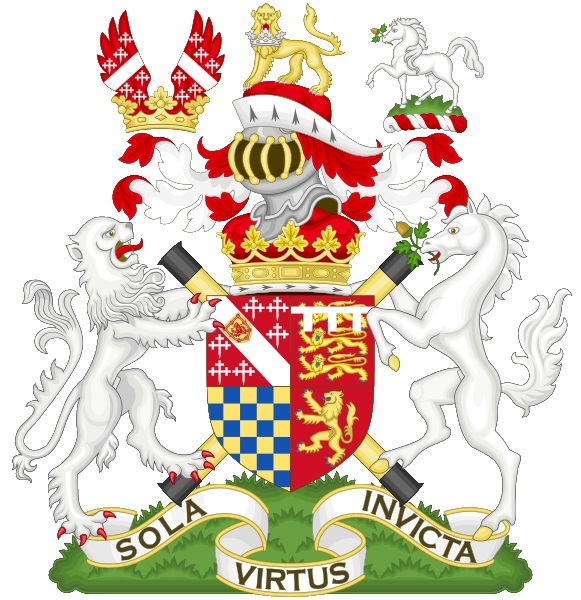 The Dukes of Norfolk are the premier Peers of the Realm, apart of course from the Royal Dukes, and despite their Roman Catholicism have in their role as Earl Marshals of England been a integral part of state pageantry since the year dot. 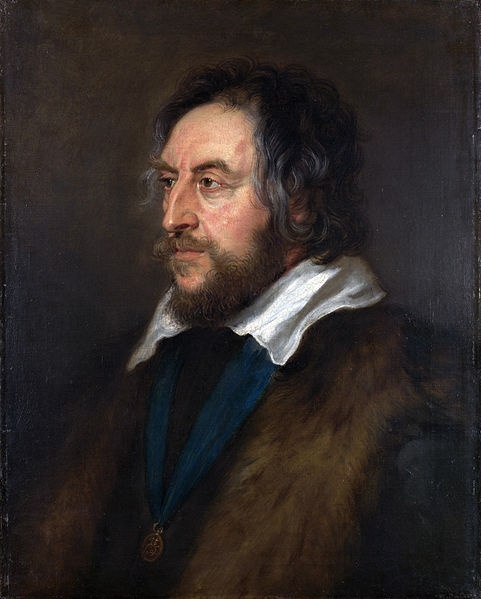 Their ongoing pre-eminence shouldn't blind us to the other ducal families, some of which have struggled to survive or have expired completely – see here for an entertaining and informative update on their collective health. 'Lords of the Manor of Glossop' is a phrase which requires a bit of unpacking. What is a manor? You may well ask. Historically it was the basic unit, fief or fee, of feudal tenure, held by a vassal (or feoffee) in return for an oath of loyalty to the aristocratic owner of the rural swathe of which that manor was a part. But nowadays it implies a bucolic estate with a Big House and a tenant cottage or two (as in the BBC TV series To the Manor Born). Technically the Lordship of a Manor is a Barony, though the title doesn't confer peerage status (ie membership of the House of Lords) and it's not used as a mode of address or form of reference. All in all, a pleasant but pointless anachronism without which the world would be a gloomier place – however, a genuine barony was to ensue for Glossop. I remember Glossop in the early 1950's as a pleasant country town on the edge of the Peak District, but not exactly a major trophy in the land-owning Premier League (though at the age of eight I was more interested in Dan Dare's ongoing contest with The Mekon anyway). But the fortunes of Glossop seem to have prospered mightily from at least the time of Bernard Howard of Glossop (1765 – 1842), 12th Duke of Norfolk, and his son Henry Howard of Glossop (1791 – 1856), 13th Duke (and son-in-law of the richest man in England) onwards. A review of the family tree might be useful at this point! And there is a very useful history of the Glossop Howards and Glossop Hall right up to the present time, also produced by the Glossop Heritage Trust. The next incumbent was Edward Howard (1818 – 1883), 1st Baron of Glossop! At last, a tangible status and independent membership of the peerage – and I'm not trying to be patronising: such things were immensely important then and are not unimportant even in these meritocratic times. From my own point of view, his greatest achievement was to rebuild Glossop Hall in 1851, which formed an iconic background to an idyllic period in my childhood (ca 1952 – 1954) during its later incarnation from 1927 as Kingsmoor School, which I attended as a dayboy – including Saturday school as well. What a magnificent building it was – ideally adaptable to the complexities of a busy boarding school – and with the most sumptuous oaken panelling, staircases and massive fireplaces, and that glorious chapel with its great oaken gallery at the rear – perhaps originally intended for the staff to participate discreetly in the family's daily religious observances. 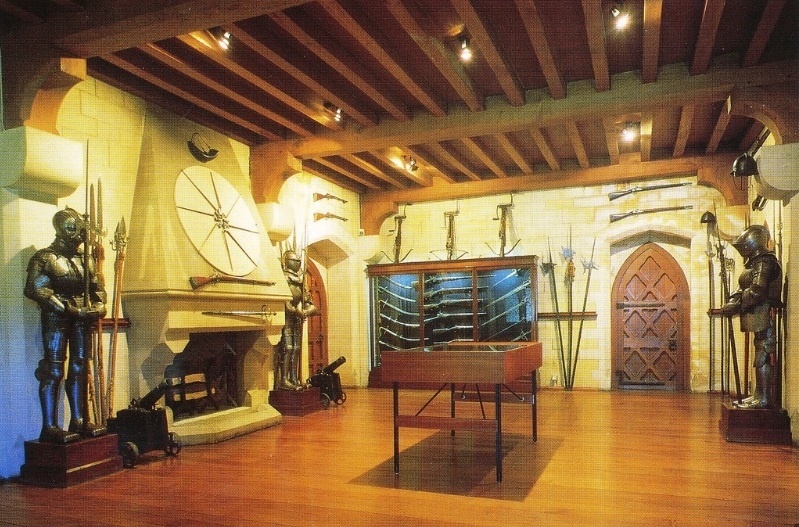 The huge kitchens, the extensive outbuildings and the vast terraced lawn at the front, were also just the job for feeding, teaching and exercising the children in spacious and civilised surroundings. Kingsmoor was closed in 1956 and demolished in 1959 – barely a hundred years after its inception. What vandalism – but hopefully it still exists in some timeless dimension in which it may be revisited in an astral afterlife. Although Glossop Hall has gone, it's nice to know that the present 18th Duke as 5th Baron of Glossop still takes an active interest in the town of Glossop itself. 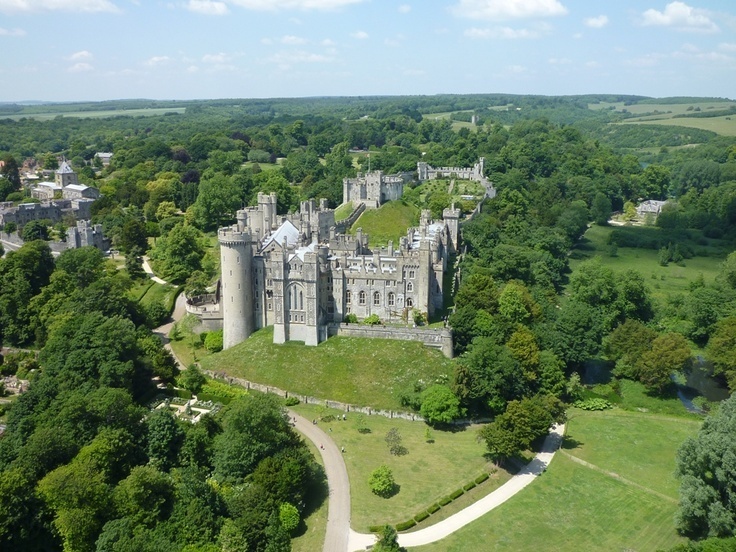 But it's sad to hear that he has moved out from Arundel Castle for family reasons – as a small boy living in Chichester in 1954-55 my greatest treat was to be taken by my father on a tour of the Castle and in particular its armoury, in which I could linger for an entire afternoon – the photograph below can scarcely do justice to its size and the variety of items on display.